ACCOR’s patented 4ALL BOX is the ONLY box preventing hidden in-wall leaks with the valve-to-pipe connection fully sealed within the box with a secondary O-ring to seal box to pipe. Can be installed where piping is plumbed from either the top or bottom. Includes front & back support tabs for a sturdy stud mount and a unique pipe supported design for center mount between studs. All box configurations fit copper, PEX or CPVC pipe with or without water hammer arrestors. A sturdy protective cover keeps installation clean from paint and job site debris. ACCOR’s trademarked icemaker box design is round so it can be installed where piping is plumbed from either the top or bottom by just rotating the box housing. All box configurations fit copper, PEX or CPVC pipe with or without water hammer arrestors. A protective cover keeps installation clean from paint and job site debris. Available with Dual Layer Braided connectors. ACCOR factory attaches its icemaker connector to the valve. This design eliminates compression joint leaks found when multi-vendor parts are manually connected to a valve in the field. 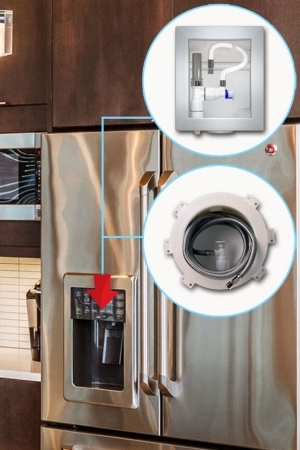 Its superior EPDM rubber seal creates a most reliable connection to the icemaker appliance. All ACCOR valve/connectors are 100% non-metallic and certified lead-free and health safe per NSF 61/9. Also available as a one-piece valve/connector with ¼” outlet for applications that do not require an in-wall mounted box setup. Product line includes a special dual-application tee where one shutoff for two outlets (sink and icemaker) is desired and code-approved.